THIS IS A GEM DISCOVERED IN DUST-LADEN HISTORY. THIS IS A LETTER MAILED TO THE FUTURE. A HISTORY WITHOUT A RECORD HAS NO TRUTH. A NATION WITHOUT A MEMORY HAS NO FUTURE. As a student in school, I always loved history. It was never just dusty old dates to me, but rather, it was the story of people’s lives, often doing amazing feats—just like in the movies. So when I was hired to write a script for a narrative film about the fascinating story of Allied POWs, who were imprisoned in Mukden, China by the Japanese during WWII, I jumped at the chance. Since 2015 was the 70th anniversary of the end of the war, it was decided to first make a documentary version of this story to catch this historical date. Though we did not have a long schedule, producer Liu Yangeng expertly put together a team of Chinese filmmakers, headed by veteran director, Shen Haofang, to capture the actual stories of some of the men, who lived through this difficult time. We planned our project through email and Skype from both sides of the Pacific. Then, with the help of Ao and Pat Wang’s Mukden Remembrance Society, we were put in contact with former POWs still living in the U.S. I flew to Washington DC to see what film and photos I could find in the U.S. National Archives and there met Director Shen, face to face, along with his skilled team when they flew in from China. What followed was a fascinating journey, as we all traveled a winding path across the U.S. to record the stories of this amazing group of men. They are all in their nineties and varied in the quality of their health, but they all still had an indomitable spirit. But our journey was not always a happy one. Some men, who were scheduled to speak with us, became ill and canceled, after we had traveled a long distance to meet them, and one passed away not long after we interviewed him. But this adversity only spurred me on that we must get their life stories on film since they are all disappearing quickly. Director Shen, who speaks Japanese, interviewed a number for people in Japan, including a former male army nurse, who had worked at the Mukden camp, to get the other side of the story. Then, inspired by these men’s stories, we edited historical film from that period with filmed recreations of their stories—many shot in the actual camp and its buildings (now a museum)—to tell the extraordinary tales of men pushed to their limits by cruel jailers and how they fought back in any way possible. These men, often called “The Greatest Generation”, lived up to their reputation and revealed to us incredible stories of death, hardship, resistance, and their ultimate victory. I am proud to have met them and only hope that they, and their families, will enjoy this film as much as I do. 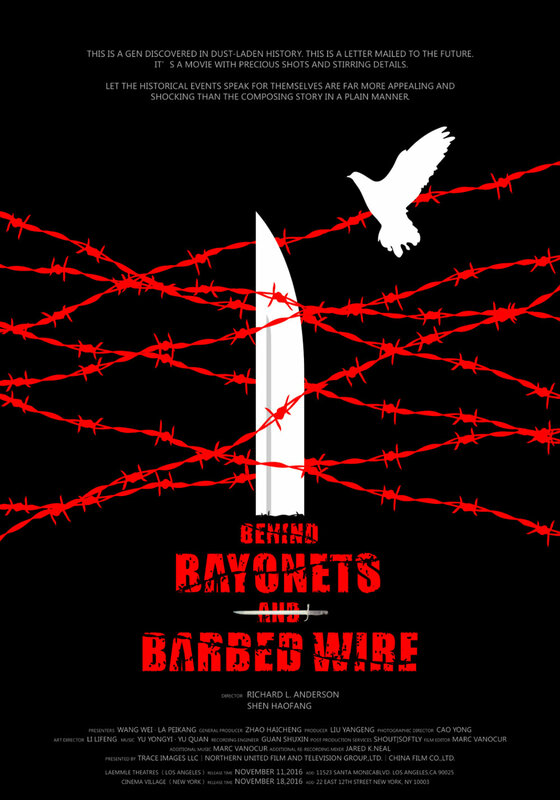 The documentary film “Behind Bayonets and Barbed Wire” took the Mukden Allied POW Camp, established in Shenyang 70 years ago, as the entry point to develop the plot. The film told the stories of POWs by interviewing the former prisoners or their relatives, combining recreations of their experiences and historical records. This documentary also tried to structure a unique WWII panorama by presenting the little-known stories to the audience. With this precious opportunity and special perspective, the relevant structure is required to reflect the grand structure of World War II. Without such a grand structure, people could not be awakened by the meditation and suffering of the misery of the POWs. Without such a grand structure, people could not sense the changes of the world’s shape after the ending of the war over70 years ago. The in-depth exploration of this subject has real significance. To show this story to the audience is the creating purport of the movie. As a Chinese director, it’s a rare experience to tell this story by standing at the critical 70th anniversary of the ending of WW II. Read more reviews from people who have watched the movie.. Your valuable input will be posted to this page after submission.